Nabil Yatim talks to the Star about Toronto police Const. James Forcillo’s conviction, his son’s death and the ‘indescribable’ pain of the last three years. It is usually a small reminder that triggers it — a young man wearing a black baseball cap like the one Sammy used to wear, or a teenager whose style reminds him of his son’s. And for a split second the weight of three years’ grief lifts, and Nabil Yatim thinks he sees his boy walking down the street. The reality that his son is gone is otherwise inescapable. In the same massive University Ave. courtroom where Sammy’s final moments have been parsed and replayed on video at all angles, Nabil Yatim listened Thursday as a judge went over the now-familiar facts of July 27, 2013, a notorious night in this city. Nine bullets fired from Const. James Forcillo’s gun, eight striking Yatim. The last six of those bullets — fired after a five-second pause, as Yatim lay paralyzed and dying from the first volley of shots — determined by a jury to be attempted murder, and called “egregious” by an Ontario judge in a scathing sentencing decision. Alongside Sammy’s mother, Sahar Bahadi, and sister Sarah, Yatim then watched as Forcillo was handcuffed and taken to jail to serve a six-year sentence. In an exclusive interview Friday, a resigned anger could be heard in Yatim’s voice. On Friday morning Forcillo, 33, was granted bail pending an appeal of his conviction and sentence, after he spent his first and only night in jail since the shooting. Immediately after getting the news of his son’s death while on a business trip in the U.S., Yatim, a retail management consultant, says he took things hour by hour, day by day. He became a “hermit,” never wanting to go out, avoiding family and friends, because the subject was always the same. Harder still is the public nature of the family’s grief. Sammy’s death and the unprecedented conviction of a police officer for attempted murder have made international headlines. Yatim finds himself reluctant to introduce himself to strangers, knowing his name will prompt questions — are you related to Sammy? With psychiatric help and medication, Yatim says he is at least now able to sleep. “I have a little bit more strength than I thought,” he said. But Yatim’s worldview has been fundamentally rocked by his son’s death. Everything, he says, is seen through a darker lens. His daughter is his main motivator, his reason to keep going. Two years younger than Sammy, Sarah has been the hardest hit by the death. The siblings were extremely close, Sammy her guardian and protector. In the hours after Sammy’s death, it was Sarah, then 16, who had to identify her brother’s body. She is “traumatized,” and has dropped out of school. “I am very concerned about her,” Yatim said. He is trying to get her professional help, even check her into a residence program to treat post-traumatic stress, but the family can’t afford it, Yatim said. “I miss you more everyday. I better see some justice tomorrow people!” Sarah wrote on Facebook this week, one day before Forcillo’s sentencing hearing. Speaking to reporters Thursday, shortly after Forcillo was sentenced, Yatim’s parents said real justice was impossible, because no amount of time in jail could bring back their son. Alongside his lawyer, Ed Upenieks, Yatim also eagerly awaits justice through another avenue. Yatim is frustrated with the delay in his complaint to the Office of the Independent Police Review Director (OIPRD) about both Forcillo and Toronto police Sgt. Dan Pravica. Pravica was the officer who Tasered Sammy moments after the 18-year-old was shot eight times. Yatim says people frequently asked him what has happened to this officer. Rosemary Parker, spokesperson for the OIPRD, recently said in an email that “the OIPRD is proceeding with the investigation, as the (Forcillo) trial is over.” It’s not clear how the appeal will impact the OIPRD’s probe. Yatim takes care to say he is far from anti-police, that he believes the majority of officers are “superb, nice people.” He appreciates the strides Toronto police have taken since the death of his son, including commissioning an independent review of police use of force and acting on its recommendations. Since Sammy died, Yatim noted, there have been 19 fatal police shootings in Ontario, a figure cited by Ontario’s ombudsman last month when releasing a report on police use of force, one prompted by Sammy’s death and the public outrage it inspired. 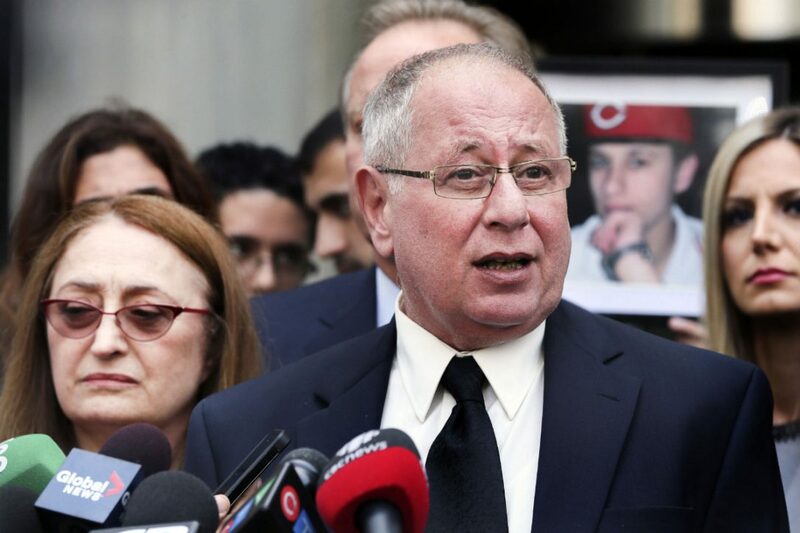 If those shootings stop, Yatim said, some good will at last come from his son’s death. He spent virtually no time in jail before being released "on bail" pending an appeal. This is the standard tactic of police accused who have unlimited finances. Meanwhile, Legal Aid Ontario targets males who are victims of domestic violence to deny them legal aid for appeals of convictions based on outrageous fabrication of evidence by police. If want to live in the most corrupt province of Canada come to Ontario. If you want to be the victim of a corrupt police force that is the largest criminal organization in Canada come to Ottawa. If you want the most corrupt father hating corrupt judges come to Ottawa. Its also where you will find corrupt prosecutors who knowingly prosecute male victims of domestic violence on a habitual basis. Its enough to make you want to puke.